I’ve just clocked up 1700 miles on the V-Strom 650XT so my #ride5000miles challenge is coming along nicely. 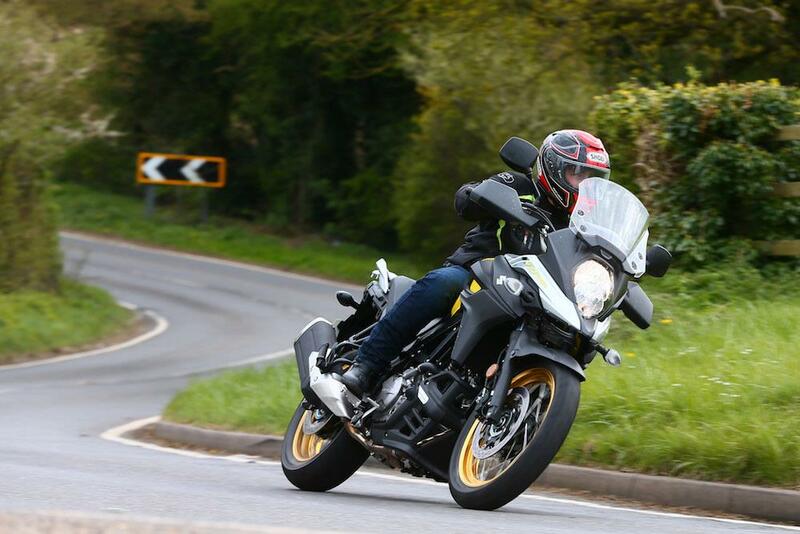 It’s funny, the more I get used to the V-Strom I keep starting to think it can be a little dull, but then I’ll go out for a blast and surprise myself with just how much fun it can be. I think it might be that over the last few weeks I’ve done a lot of long distance, motorway miles on it and trips like that are almost effortless. The upright seating position and wide bars just make it so comfortable and it just plods along at motorway speed with ease. Of course, when riding for fun you do have to push the bike a bit as it’s just so sensible low down the rev range. It might only be a 643cc V-Twin, but it sure sounds good when you give it some, even with the standard exhaust. I finally got round to raising the screen a little. The standard screen is adjustable to three heights, and I’ve moved it from the lowest – with which I was getting quite a bit of wind blast – to the highest and it’s definitely an improvement. It was a relatively quick job, took five minutes with an Allen key and wasn’t too fiddly either. It’s definitely an improvement but it could still be better, maybe I’ll have to look into trying an aftermarket screen.